When things are going great in life, we can always find reason to cheer. Yay! My daughter just had a baby. Yay! I just got a promotion. Yay! I won a contest. But what do you do when things aren’t going so well in life? We are to be joyful in all situations—at all times in life. 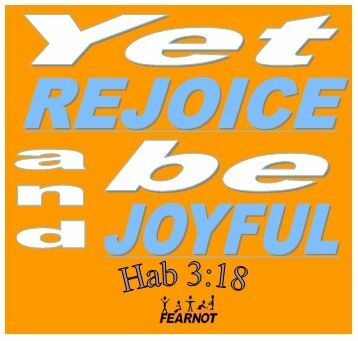 We are to rejoice always, when things are going well and when we don’t really feel like rejoicing. Do you feel like rejoicing when your mother is sick in the hospital? Do you feel like rejoicing when your house just burned to the ground? Do you feel like rejoicing when you lose your job? We don’t always feel like rejoicing but it’s because of our attitude. We look to what we lost rather than to what we have gained. We always have a reason to rejoice. We always have a reason to be joyful. These moments are temporal. God has given us so much—eternal life, eternal blessings, and even right now as I am going through some very dark moments in my own life, I can look around and easily see that I am blessed. Yet I will rejoice. Thank you Jesus! Thank you Lord! Praise God for He is ALWAYS good! On Saturday mornings we have a family tradition that occurs almost like clockwork. Since my children were born nearly every Saturday morning I make us a big breakfast with pancakes, eggs, etc. When I make pancakes, there is something that I do that many people would find quite odd; I purposely burn a few pancakes for myself. When I was a young girl, I fondly remember my grandma making my cousin and I both pancakes for breakfast. We would eat countless pancakes as my grandma continued to add more to our pile. As she got older, the pancakes changed. There were times when she would burn the pancakes because she couldn’t keep up like she had in years past. I couldn’t refuse to eat her pancakes. I ate the burnt pancakes and developed a taste for them. Hence the reason I have burnt pancakes that I make for myself now. In life, we will be handed some delicious pancakes, but there will be times when burnt ones will come our way too. It is how you respond to those burnt pancakes that show your true colors—who you really are as a person. Anyone can gladly accept the good things in the life—but not everyone can joyfully accept the bad things. Today, rejoice and be joyful in all situations, remembering that God has a much bigger picture. It’s really not about the pancakes at all. Yes, he will be there for eight hours. He will get paid the same no matter how much effort he puts forth with stocking the shelves. But this thought that it does not matter—that I do not need put forth a good effort—is something very negative and it greatly impacts our society. We are told to do everything as if it was for the Lord. Today look at the effort you put forth, the attitude you have at your workplace, in your home, at church, in your relationship with God, etc. Do you give God your best effort or are you going through the motions till the time is up? Does it really matter? How would an onlooker see you stocking shelves—with joy serving the Lord or just passing time? As I was reading the blessings and curses in Deuteronomy, something jumped off the page in Chapter 28 of the book. It says, “They will be a sign and a wonder to you and your descendents forever. Because you did not serve the LORD your God joyfully and gladly in the time of prosperity, therefore in hunger and thirst, in nakedness and dire poverty, you will serve the enemies the LORD sends against you” (v. 46-48a). The words “joyfully” and “gladly” are words we do not always see with “serve.” Sometimes the word “serve” gives us a bad taste in our mouths. The very thought of serving is to perform a duty for someone else. What about us? So we are to serve joyfully and gladly? As if we are happy to do it? As if we like doing it? The number of church members who serve the church is simply sad, with studies showing that about 20% of the members are serving the Lord. If we consider the people who are serving the church, which is a small number of the actual congregation, we then should consider how many of that small group is serving “joyfully” and “gladly.” To serve in this way, means that the person’s heart is in this service. To serve in this way, means that the person is not doing it because it is what a person does, but because the person desires to serve the Lord out of love for the Lord. Today, consider if you fall into the 20% category at your church. Are you serving the Lord? If yes, consider if you are serving “joyfully” and “gladly” at the church. Is it a burden or a joy? If it isn’t a joy, perhaps the area you are serving in is wrong. Whether or not you serve, seek out the talents God has given you and see how you can use them to serve Him. When you find that place at the church that you were meant to serve, the joy will come. It is important to serve the church, and it is important to have that joy to spread around to others. We all need more joy in our lives. How many people does it take to change a light bulb? Many people have heard this question asked as part of a joke. This morning I entered the kitchen and realized that it was a bit darker than usual. I looked to where the light usually comes from and noticed that there was a bulb in some cylindrical thing and it was out. I had no clue how to change this bulb or even where I could purchase a replacement bulb. Two months ago, I did not even know that under-the-cabinet lights existed. It took me quite some time to remove the old bulb. Then I went over to my laptop and started to search for the numbers I found on the bulb. I got a lot of information, but I had to sift through things to make sure it was the correct information. Then it was off to the store and I was so confused when I found all of the different types of bulbs in the lighting supply aisle. There were so many bulbs that looked like the exact same bulb. I had to take the old bulb out and make comparisons. I had to read paperwork. I had to take my time to make the right choice. When I got to the cash register, I told the cashier that I was so nervous to install the bulbs. She could tell that I was in need of a confidence boost and she let me know that I would get the job done, and she even gave me some pointers. She was right! We are often faced with situations that are new, things that are more grueling and more important than a simple light bulb. We are called to do things that are challenging. We are given work that seems nearly impossible. Some situations overwhelm us if we let them. What do you do when you have your own light bulb to change? Your light bulb could be anything. You do the same thing you do with anything that comes your way in life. * Do not hide from the situation. Hiding from the situation will not make it go away. Remember that you are a child of God (Galatians 3:26). God can do more than you ever could imagine (Ephesians 3:20). If God is for you, what can be against you? (Romans 8:31). Many times, you will find that the situation is a great test of faith which can result in spiritual growth that will help you to one day be complete (James 1:2-4). * Take it one step at a time. There is usually no need to rush a situation. When Jesus was ministering on earth, notice that He wasn’t rushing around healing and feeding. He took steps. He took time. He left us an example of great patience and self-control. If we practice this behaviors, we are more likely to be successful. Remember that “the steps of a man are established by the LORD, and He delights in his way” (Psalm 37:23 NASB). * Prepare yourself. Do the research. Read. Learn. Grow. Even when I was changing the light bulb, God’s Word was in my head and heart. Spending time in His Word helps to provide us with what we need when we are facing tough situations. Seek Him for guidance. His Word provides instruction and encouragement (Romans 15:4). * Do not be afraid to ask for help. Don’t let your pride get in the way. God wants us to be part of a community. We each have our own part to play. We each have different talents, different specialties. We are all given the command to love one another. Sometimes we do the giving, sometimes we do the receiving. We should always seek help from Him. But remember, there are times that we need to ask others for some assistance. People do not always know what is going on in your life and they cannot read your mind. Luke 11 gives us instruction on how to pray as it also tells us of a friend who helps another. The friend is knocking on the door and announcing the need. Sometimes we are the helping friend, sometimes we are the knocking friend. * Surround yourself with positive people. Positive people will be encouraging. Positive people share, love, and can see the good in things. Proverbs 11:9 states, “With his mouth the godless man destroys his neighbor.” Words are powerful and if you are surrounded by negative people, in time it will start to become your way of life. Proverbs 17:22 says that “a joyful heart is good medicine” (NASB). When you are facing tough situations, it is wonderful to have some “good medicine” from some positive people. Finally, show yourself some grace. God thinks you are worth it! At times we slip up and end up having to face the music. I would say it is usually not fun; however, it is a part of life. When you make a mistake, make the wrong decision, go against the rules, etc., there are consequences. This morning my daughter didn’t want to school, because she knew she would have to face the consequences of forgetting her homework at school. She understood she deserved the punishment for missing her homework, but she didn’t want to face the hardship of the punishment. I have taken notice to a lot of parents who try to keep their children from punishment and discipline. I use the word “discipline” also because punishment is given to those for justice of wrongdoing, but discipline is training that will help correct and perfect a person. I have heard a parent say, “Well I feel bad for him.” It is okay to empathize about the situation, because we have all had to undergo consequences; however, we cannot try to teach them to avoid the consequences. We cannot tell them ways to get around facing the music. In the Bible, we have a lot of promises of blessing and of love. We can read some verses standing alone and feel like we are basking in the love of the Father and the world is ours. But if the Bible is read closely, there is another side that people like to leave out of the equation. There is punishment and discipline in life. There are consequences. Our consequence for sin is separation from God. We have redemption through the blood of Christ; however, it doesn’t give us a free pass to go on sinning, nor does it change the fact that there are consequences for our actions. We are not perfect either, and so we need discipline to help make us a better person. Today, maybe you have some consequences that you need to face for your actions. Perhaps you have been putting off being honest because you do not want to face what comes next. Or maybe you are a parent and you try to shield your child from facing punishment. Please know that if you “protect” your child from punishment, then you are saying that their actions are okay. You are teaching the child that they do not deserve the punishment. My daughter went to school today without her homework. She will be stuck serving time instead of enjoying recess. It will help her to understand that she needs to remember to do her homework. We all make mistakes and misjudgments; we all face the consequences. Nonetheless, if you are honest about your shortcomings and you face the music, you experience personal growth and you become a better person. You may not see it at first, but understand that God loves you and He wants the very best for you.